It was so ironic that my son had asked me if we could visit the mac n cheese place we went to years ago. He was craving it he said and I had to crush his hopes because I told him Artesia was too far away. Fast forward two weeks later and a friend of mine asked if we’d like to join her and her family for mac n cheese at Elbows. Apparently, they’ve opened a new location in Brea — okay, still not close, but at least it’s in OC. Naturally, the kids were excited, I was too because there were so many of us which meant we could order a lot to try. It has definitely been too long. I didn’t remember this many selections before and, there were now sandwiches and salads as well. 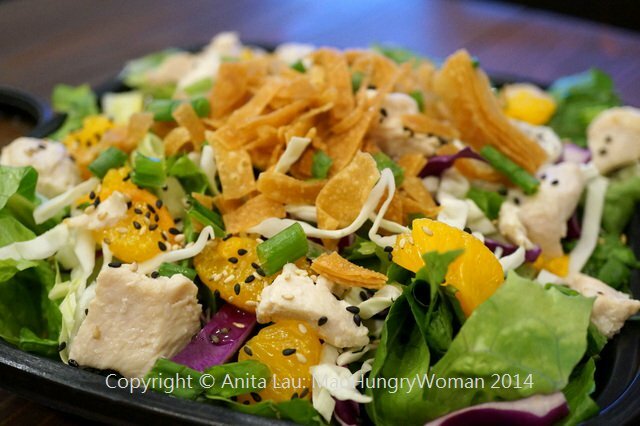 My friend and I wanted to start off with a salad and Chinese Chicken Salad ($5.50/$7.50) of mixed greens, green onions, carrots, mandarin oranges, grilled chicken breast topped with crispy wonton stripes and sweet oriental ginger dressing was good. I liked how it is served in a to-go container so if you wanted to pick this up for lunch, it’s quick and easy. I was definitely partial to the Green Bean Fries ($5.95). 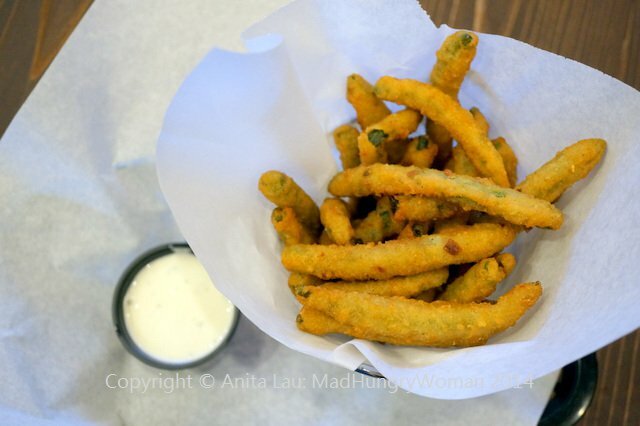 Seasoned and battered, these crunchy sticks were absolutely delicious — too bad the kids didn’t care for green beans. More for us! 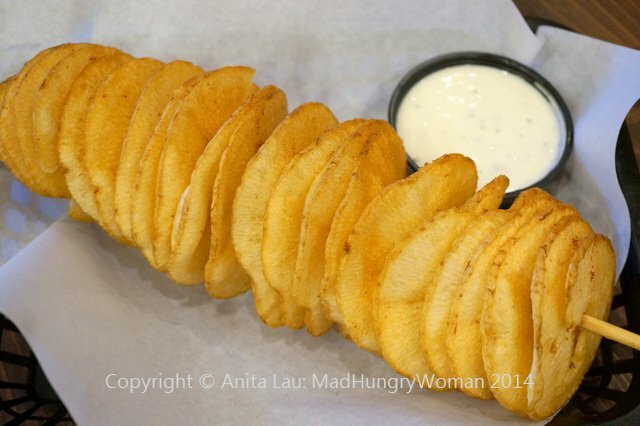 What everyone fought over was the Chipstix ($4.95), a potato that’s been “fan-cut” and fried. They taste like potato chips, but are so much better! 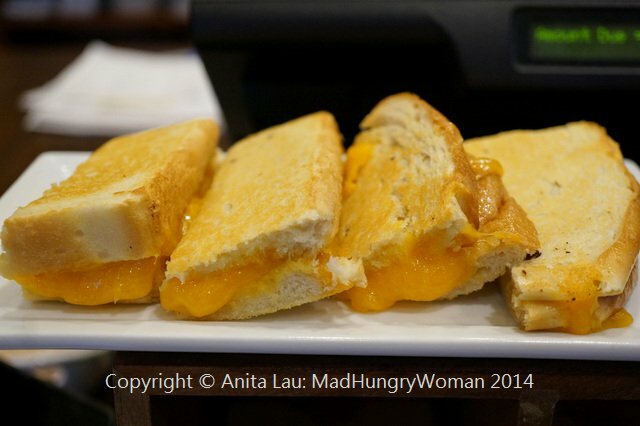 Classic Grilled Cheese ($4.95) might be the best choice if you have young kids. 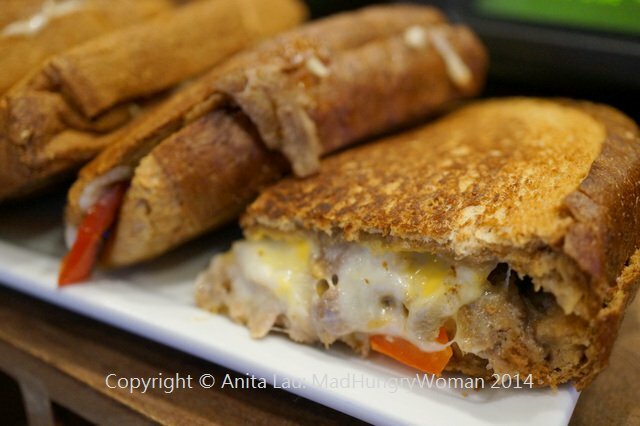 This simple sandwich filled only with cheddar cheese will be agreeable to even the pickiest of eaters. One of the kids wanted the Philly Cheesesteak Melt ($6.95) but I didn’t care for it. Filled with steak, onions, peppers, provolone and American cheeses, I thought the flavor was one dimensional and flat, requiring more seasoning in the steak. 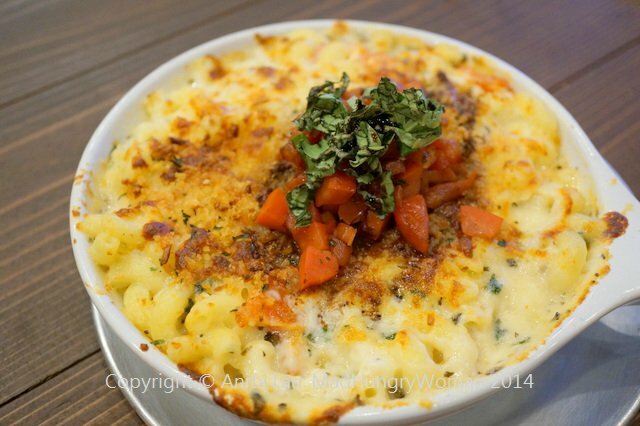 When it comes to mac n cheese, the options are pretty endless. There’s Wingin It ($8.65/$11.65) which is good for those who love buffalo wings. The menu description says sharp cheddar with buffalo sauce, but if you don’t mix everything together, you will only taste the buffalo sauce on the boneless buffalo chicken on top. I highly suggest you mixing it all together so that every mouthful will have some sauce, crumbled blue cheese and scallion. 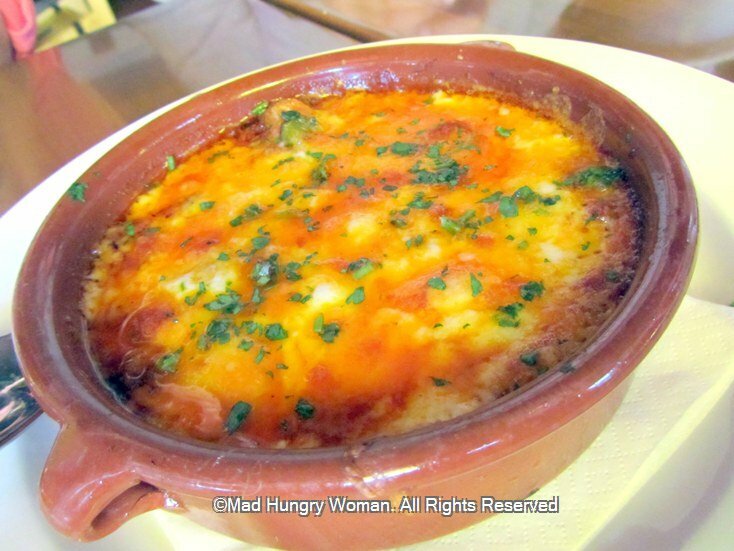 The kids loved Easy Cheesy Caprese ($8.65/$10.65) perhaps due to its simplicity. Roasted tomatoes, fresh garlic and basil with mozzarella and parmesan cheeses. I didn’t care for the cold tomatoes on top, so mix it in if you don’t either, it’ll take the chill off. Do You Want A Pizza Me ($8.65/$10.65) is self explanatory. Comprising mozzarella cheese, Italian herbs and spices topped with marinara, pepperoni is garnished on top just like a pizza. You can have this as a vegetarian dish — so no pepperoni and with vegetables instead. 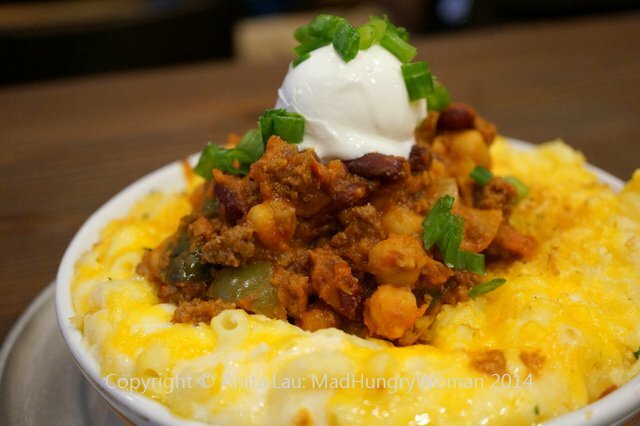 I thought Chillin’ Out ($8.65/$10.65) would have been the perfect chilli mac, however, the homemade chili was very bland and desperately needed some punch. Had the chili been stellar, this would have been my favorite dish. I did like the use of chickpeas though. We loved the name Living Fajita Loca ($8.65/$10.65) so decided to give it a try. 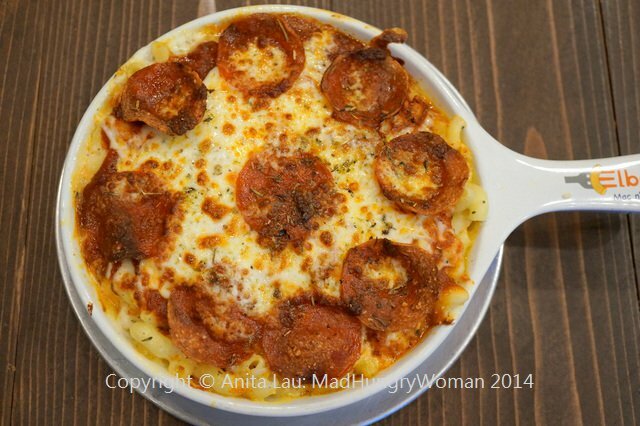 I think after several variations, my general observation is that although the options are endless, every single mac and cheese started to taste the same underneath the toppings. One suggestion would be to mix the sharp cheddar and pepper jack together with some of the toppings INTO the mac n cheese, then finish off with the remainder of the toppings to set each one apart. 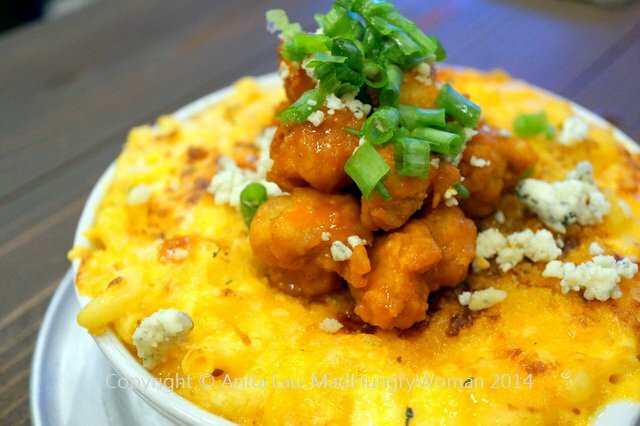 Right now, if you’re getting a spoonful of the mac n cheese without the topping, they all start to taste the same. This is why When Pigs Fly ($8.65/$10.65) was my favorite, not only because it is the closest to a classic mac n cheese, but also, there were bits of applewood smoked bacon dotted throughout the mac n cheese. This was an absolutely delicious dish, one I would keep coming back for again and again. The Swiss and gruyere cheeses were prominent, and I could taste every single ingredient in each bite. 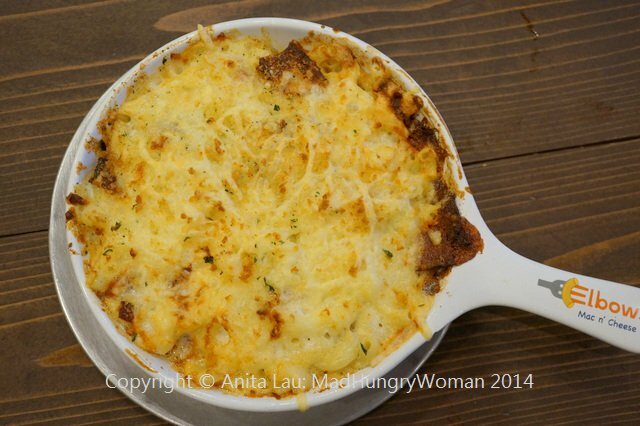 This was the only item with all the ingredients baked into the mac n cheese and not just used as a topping. Having said a mouthful, and even with the few misses, I still love Elbows. It is a great concept, and one I will visit more frequently if it was closer to me. I know how time consuming it is to make a really good mac n cheese, and who has time for that? Plus, my son loves this place! It’s a win-win all around. Brea has been getting some great eateries this year and the latest addition is a lovely Italian place called Bruno’s Trattoria. 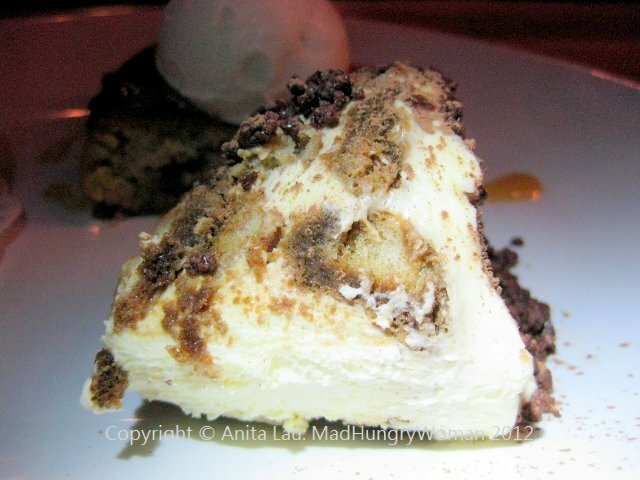 We were invited for a preview of what the restaurant has to offer and I was delightfully surprised by what we tasted. 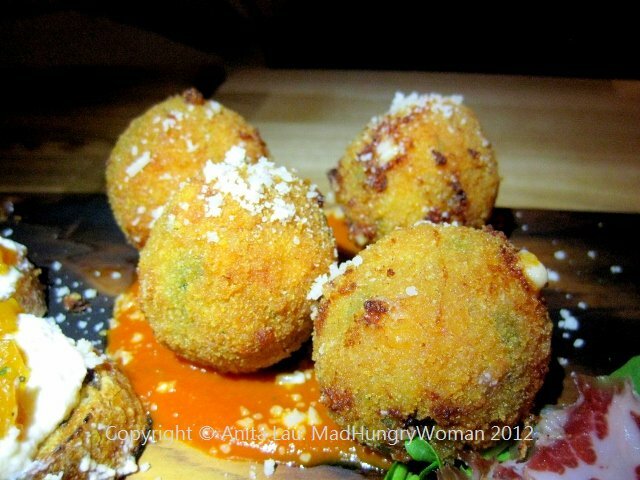 We started with an Antipasto Platter consisting of Arancini risotto balls filled with ham, cheeses, fresh herbs, lightly fried with marinara sauce. 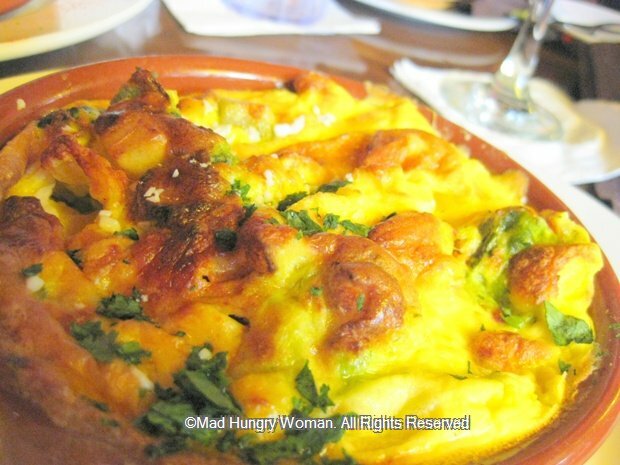 Cheesy and gooey on the inside, these delicious morsels were the ideal start to the meal. 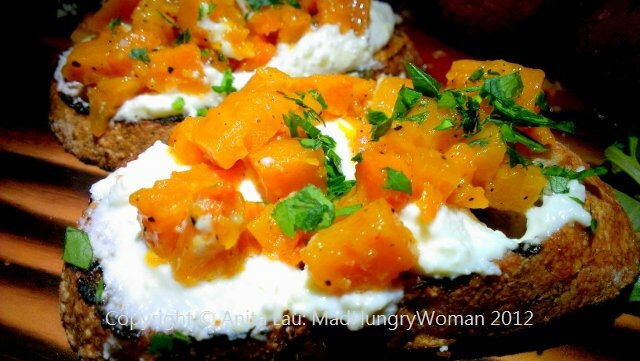 Crostini topped with butternut and fresh ricotta cheese is a nice bite with whatever it is you’re drinking. The sweetness of the butternut with the milky ricotta cheese went very well together. 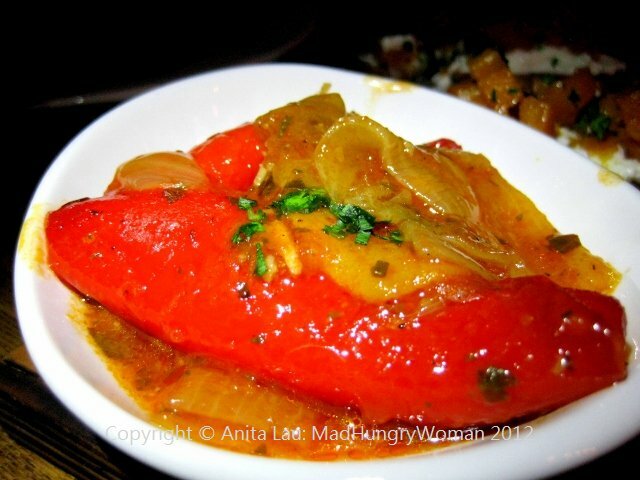 A little bowl of Peperonata red bell peppers, onion, olive oil is all roasted in-house and it goes perfectly well with the antipasti. My favorite of the appetizers was the Fromaggi/Salumi/Olives featuring prosciutto, coppa and gorgeous cheeses like fontina, ubriaco and nostrano. I was so pleased with the Pasta Duo. Pasta is made in-house and you can totally taste the difference. 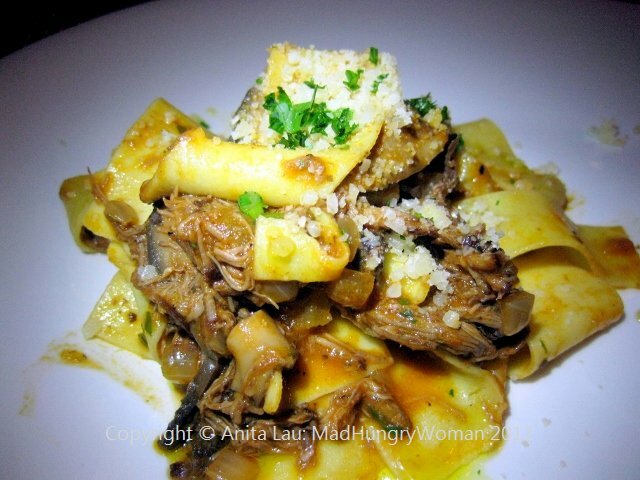 Bruno Pappardelle with braised short ribs and wild mushrooms was absolutely delicious. I have been craving the home-made pastas I enjoyed in NYC and was so happy when I put this in my mouth. The pappardelle had a perfect consistency with just a bite, and the rich short ribs and mushrooms coated the noodles to create a delicious mouthful. 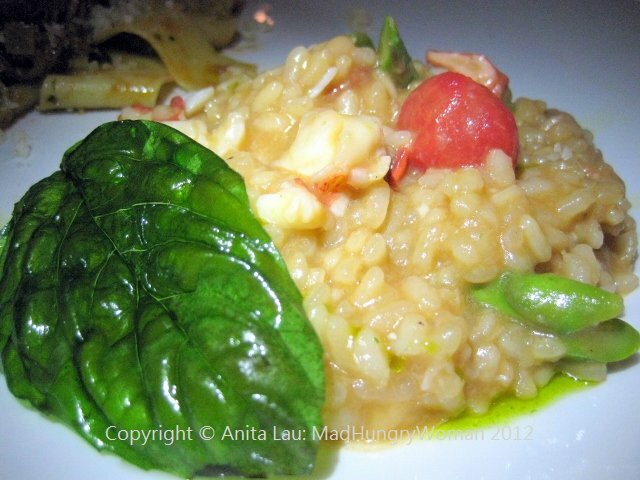 Risotto all’ Aragosta was filled with umami and the lobster, asparagus, roasted tomato and basil together with the rice was creamy and sublime. LOVED IT. Entrees came in the form of Branzino, crispy skin flaky and moist flesh underneath. 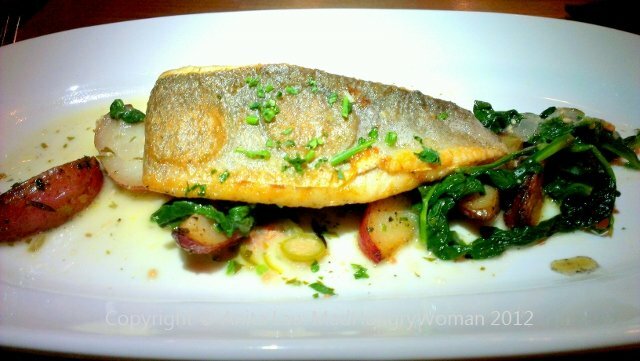 This Mediterranean seabass was tasty with a lovely lemon caper sauce. Often, lemon sauces aren’t tart enough for me, but the one here was spot on. 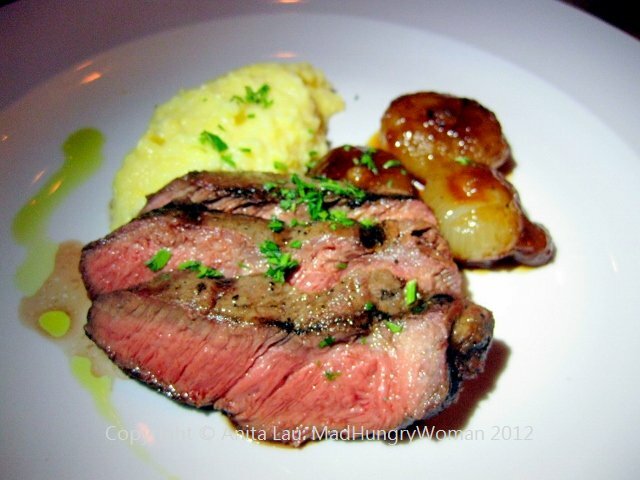 Another entree we sampled was Bistecca “Flat Iron” grilled flat iron steak served with creamy polenta and roasted cipollini onions. The latter was seasoned with balsamic vinegar and the tart sweetness was just intoxicating. 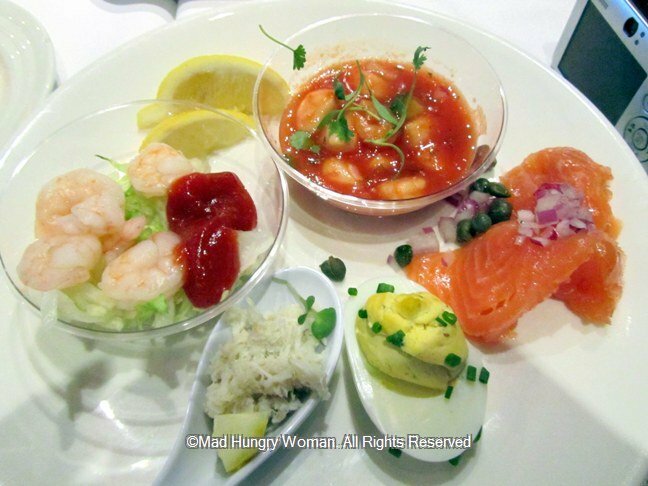 I absolutely love all these acidic flavors on the plates. Naturally when it came time for desserts I was already full, however, I was assured that I would enjoy these even though my sweet palate is virtually non-existent. 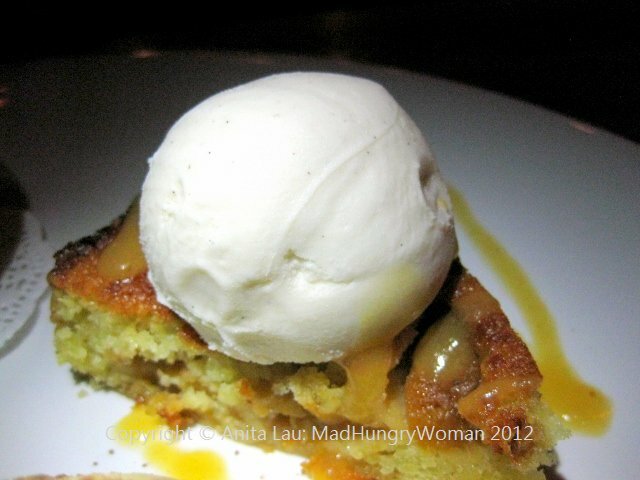 Torte di Pesche is an almond meal cake with fresh peaches, almonds and served with vanilla bean gelato. 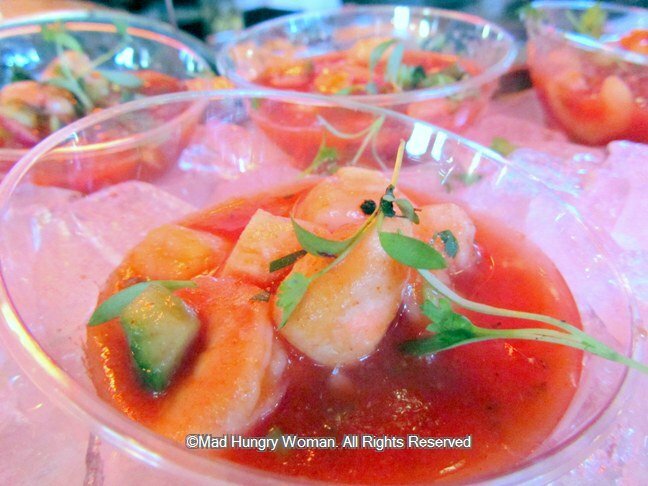 The texture was coarse and pleasing and the peaches added a great contrasting texture. Very nice. I normally dislike Tiramisu, but the one here was surprisingly good. Texturally it was even and creamy. The lady fingers were soaked through perfectly and the flavors of espresso, mascarpone, rum and cocoa melded well together. It wasn’t overly sweet which was also great for me. 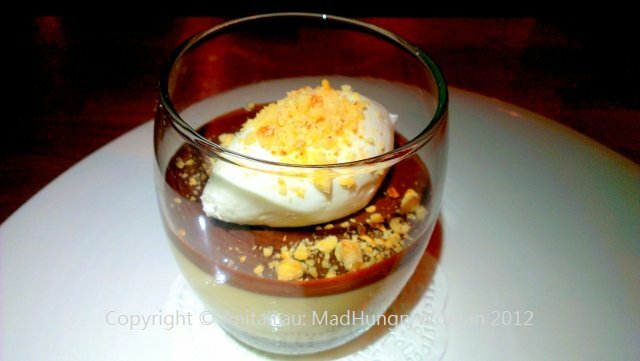 My favorite was Budino al Caramello, a caramel pudding with a touch of chocolate ganache and topped with whipped cream. Again, this wasn’t super sweet which was heaven in my mouth! 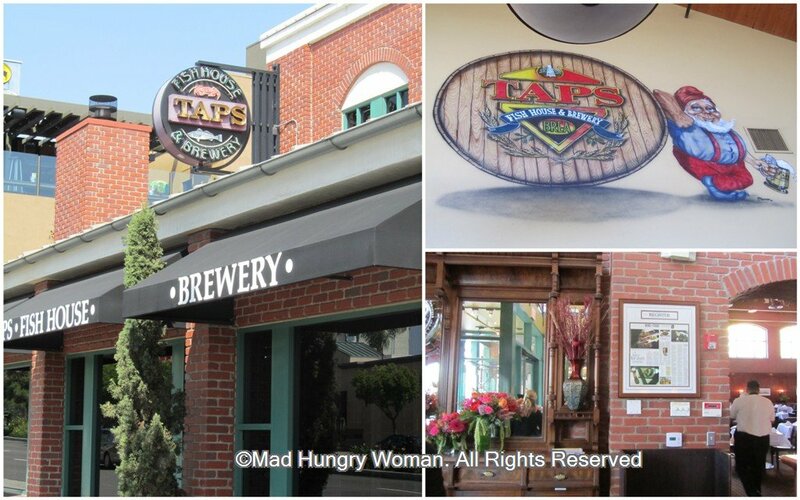 Brea is slowly becoming a little eating mecca and Bruno’s is helping the downtown area get closer to its final goal. Food is great, atmosphere is warm and inviting. I only wish I lived closer. This week, Bruno’s has generously donated a $50 gift card for one of you to win. Just leave a comment telling me which of these dishes you are most excited to try. Don’t forget to leave your FULL name to be entered. Winner announced Monday. 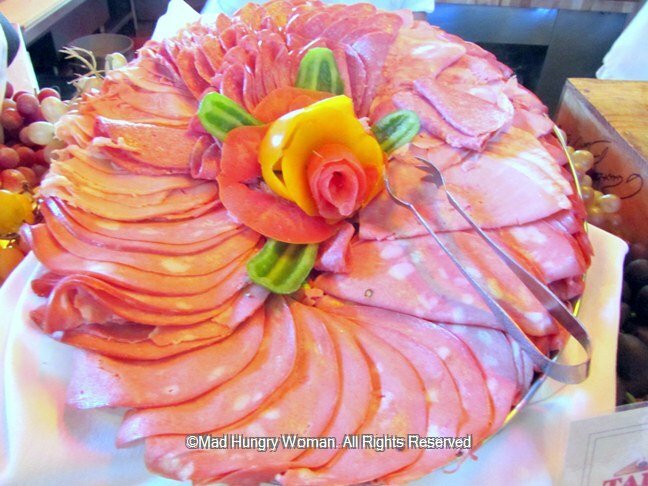 I’m not a huge fan of buffets because I can never eat a lot in one sitting. I get full very quickly and generally, I leave feeling like I didn’t get my money’s worth. So when I visited TAPS for its Sunday brunch buffet, I was surprised to find over 100 items among the choices for a mere $35.99/adult and $12.95/children age 3-12. The restaurant is packed and after a quick walk-through to peruse the vast array of food, I decided what I was going to pick for round one. 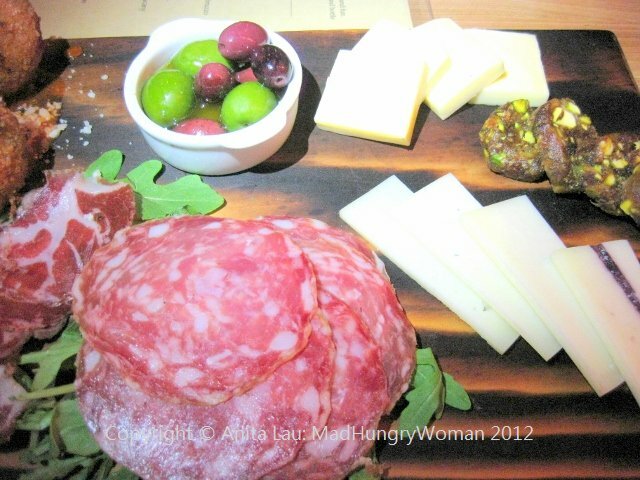 An antipasti platter offered an array of meats including salami, ham and mortadella. 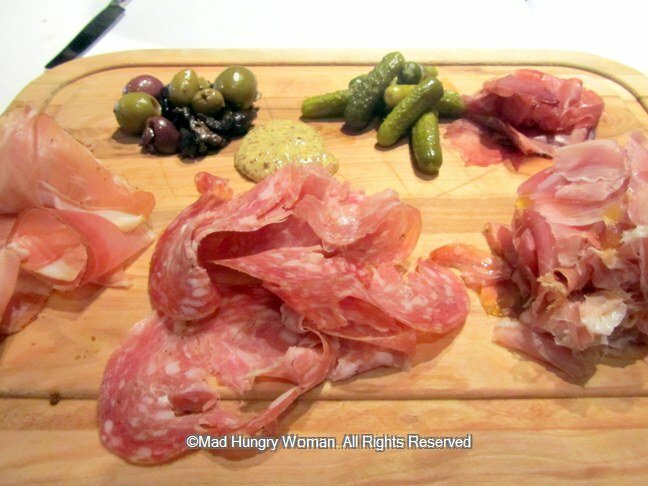 There is also charcuterie of prosciutto, speck and salami, served with cornichons, olives and whole grain mustard. A fresh station comprising oysters on the half shell, crab cocktail, shrimp and ceviche enticed and I enjoyed the latter with relish. 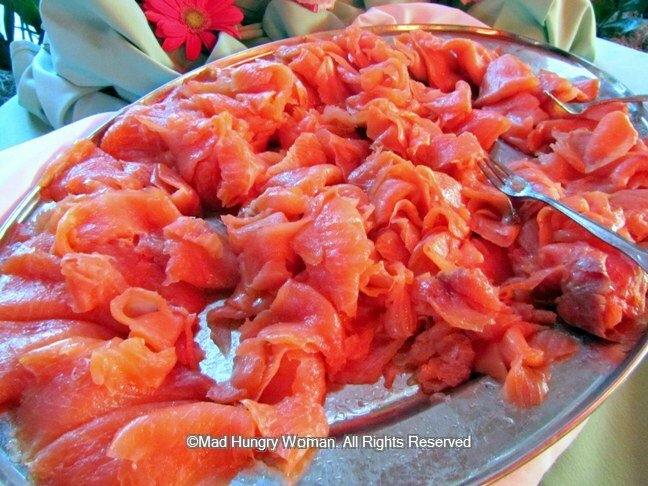 My son loves smoked salmon and I found him with half a plateful upon his return one trip. 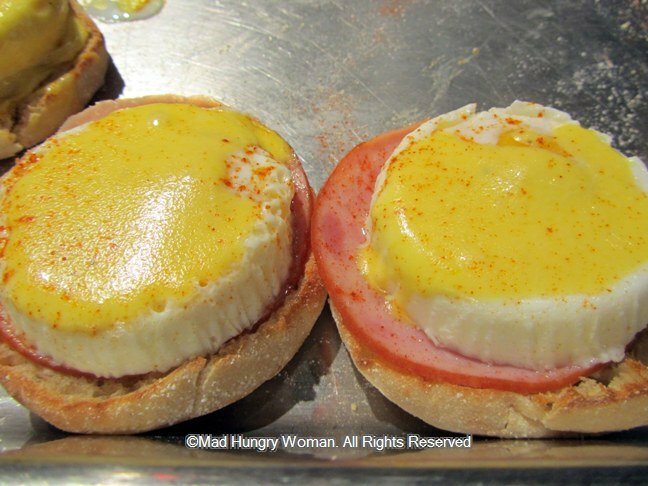 Eggs Benedict lured me into the hot food area and these perfectly poached eggs atop pillowy muffins were so immensely popular that a tray lasts barely five to seven minutes before it is completely wiped out. 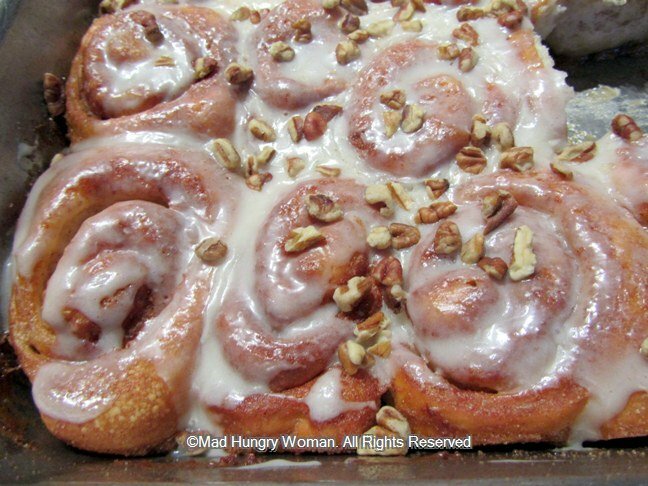 TAPS’ luscious cinnamon rolls sit in another tray next to the eggs Benedict and these were soft and gooey just waiting to be eaten. There is a pasta station with cooked-to-order combinations of your choice. 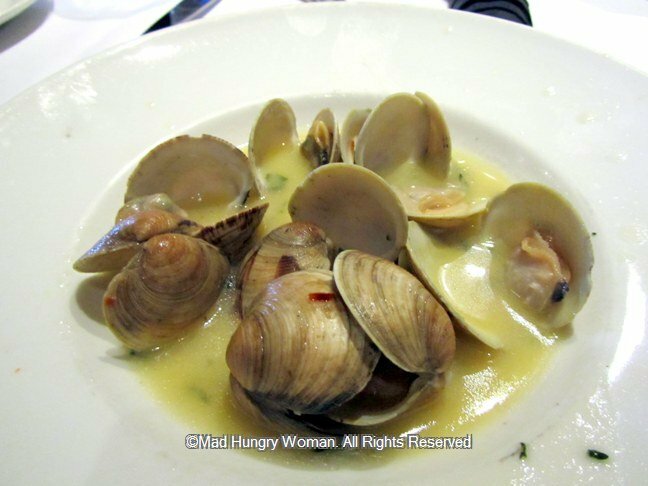 I ended up getting clams in wine sauce without the pasta and they were delicious. In order to not inundate the already sprawling buffet spread, TAPS has made it a bit more fun by adding some items you can order through the kitchen at no extra cost, such as the Chorizo and Eggs. 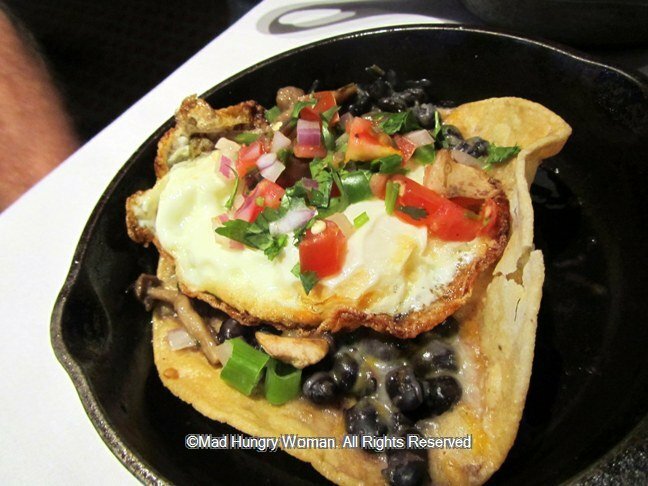 Or, the Huevos Rancheros are pretty good too if you want a meatless option. 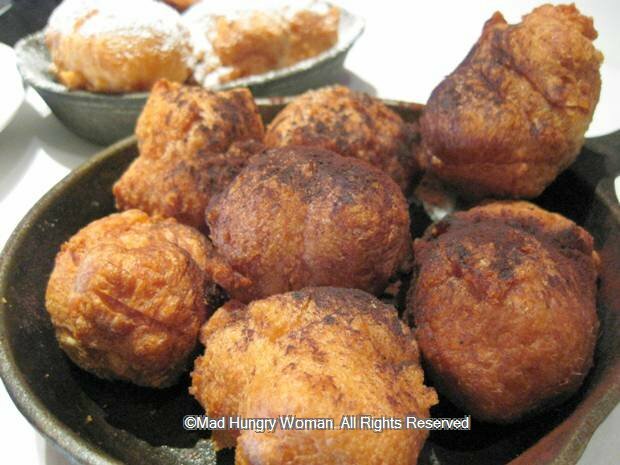 Beignets are on the same menu for $1 extra and you get seven of them. These tasted more like profiteroles than beignets and what we loved was stuffing them with whipped cream and eating them that way. SO GOOD! I’d be lying if I told you I tried everything, I don’t think I even got through half what was offered. This is the kind of buffet I like — an abundance of items I actually want to eat, with a price tag that is affordable and very reasonable. I didn’t walk away feeling like I didn’t get my money’s worth. I started with this plate and went back several times after. The price of the brunch includes mimosas, sparkling wine or two TAPS hand-crafted award winning beers — my favorite was the coffee one (can’t remember the name) — as well as tea or coffee. Do note that items on the buffet change from time to time so don’t get upset if you can’t find the things I’ve listed. TAPS Fish House and Brewery has generously offered one of my readers the opportunity to try this awesome Sunday brunch. Leave me a comment with your FULL name and your thoughts about buffets by Sunday, May 20 for a chance to win. One lucky reader will be announced as the winner on Monday, May 21. 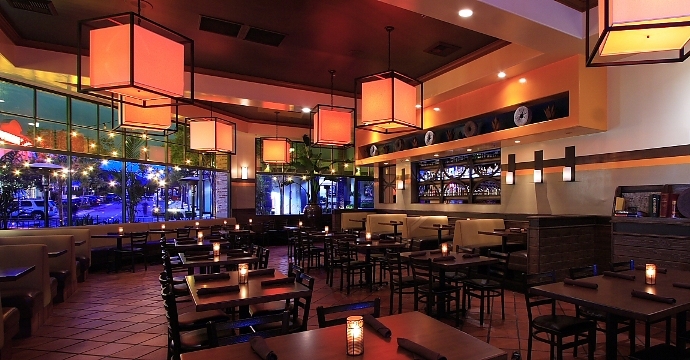 If you’re ever looking for a place to spend a fun Sunday at, look no further than Cha Cha’s Latin Kitchen in Brea. On Sundays, the restaurant comes alive with the sounds of Sombra Quieta, a Latin trio belting out lively songs with their upbeat music to brighten your day. Some people even get up to dance in between courses! I came here one such Sunday with my girlfriends and spent a few hours enjoying brunch and sipping on delicious cocktails. 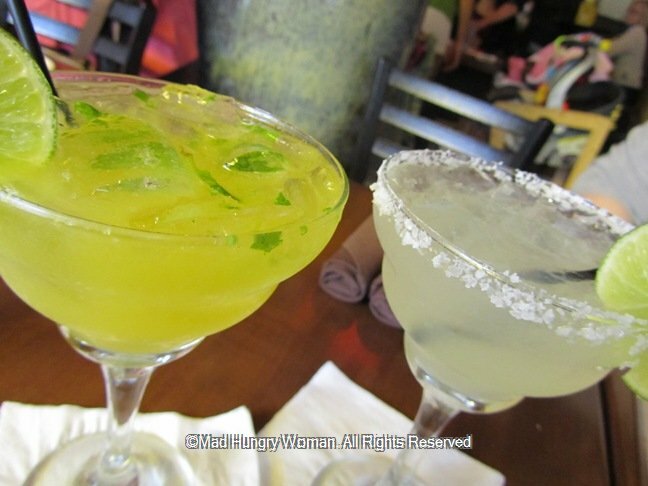 Classic Margaritas ($7.95 pictured right) is strong but the housemade sweet and sour is awesome making my mouth pucker a little. Mango Habanero ($8.95 pictured left) was fruity but devilishly strong and it took only one of these for me to feel that headiness seeping in. 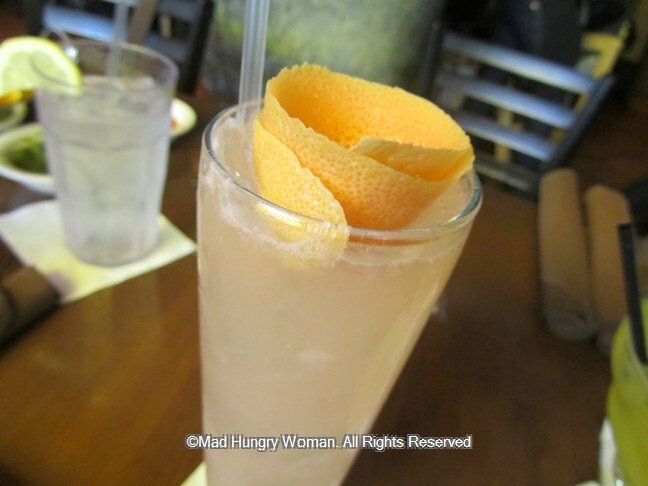 My favorite was the Cha Cha Margarita ($9.50), strong, but disguised by all the ingredients including ruby red grapefruit juice. 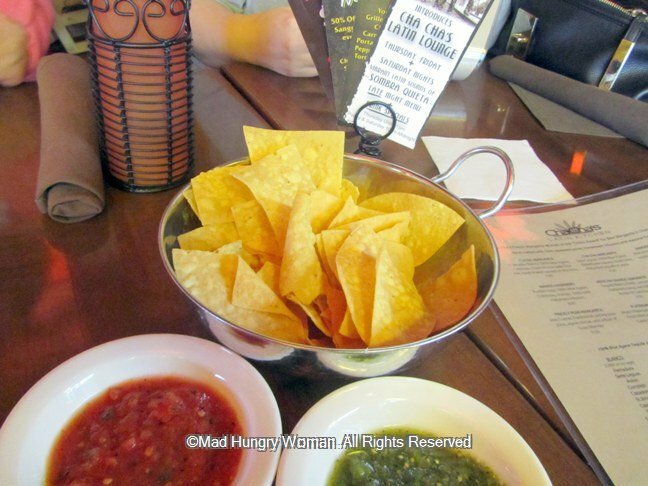 A basket of chips are brought to the table with two types of salsa. I loved the tomatillo salsa and they brought these just in time as the cocktails were seriously messing with me by now. I needed to EAT! 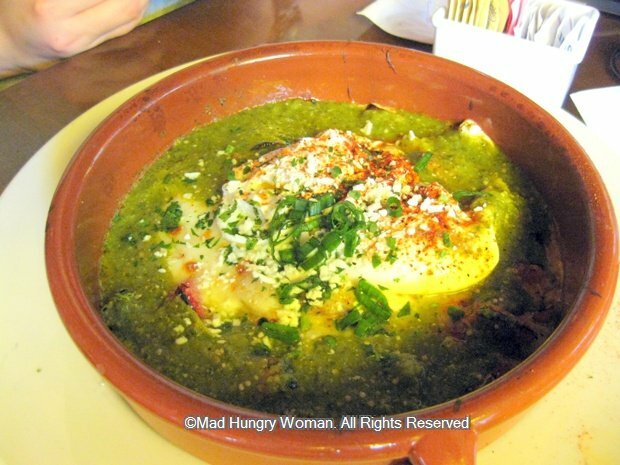 We started with Wood Fired Queso Fundido ($8.50) , a blend of cheeses, melted over potatoes and poblano peppers, served with tortillas which you can wrap the cheesy concoction with chunks of chorizo in. So tasty but so sinfully rich! 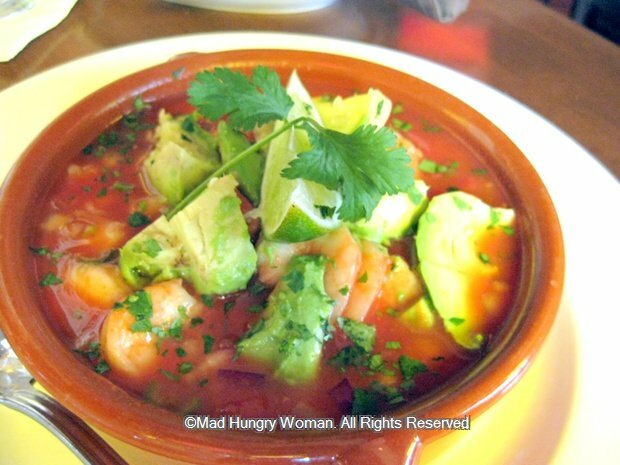 Shrimp Ceviche ($10.95) arrived in a terracotta dish with shrimp marinated in fresh orange and lime juices, Serrano chiles, red onions and Haas avocado chunks. I loved this and could possibly polish an entire order off by myself — EASILY! 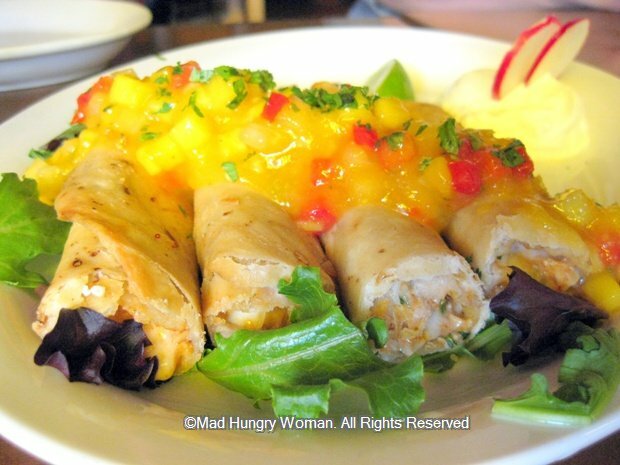 If you like crispy things, then Chicken Flautas ($14.95) may definitely be your thing. Fresh chicken, roasted corn, guajillo peppers, Oaxacan cheese are stuffed inside crisp flour tortillas and topped with mango habanero sauce. Kids will love them, but you might want to ask for the sauce on the side if the kids are eating these even though I didn’t think the sauce was spicy at all. I’m a sucker for poached eggs so Cha Cha Hash and Poached Eggs ($15.50) definitely caught my eye. 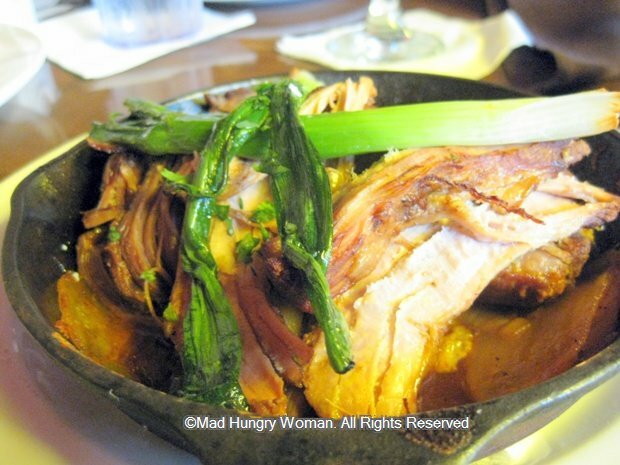 Roasted chicken, poblano peppers and potatoes are baked in the restaurant’s clay oven with cheese and fresh tomatillo sauce on top. The poached eggs are the piece de resistance of the dish. 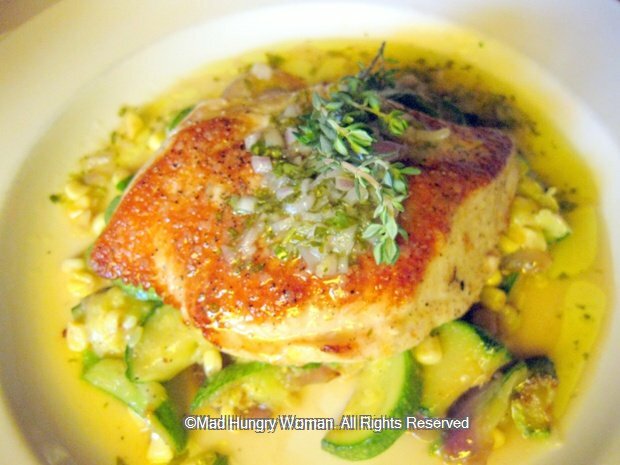 Those not wanting breakfast items can try Fresh Mahi Mahi ($19.95), a generous portion of fish pan roasted, served with sauteed calabasitas, or squash, and fresh corn with a lime herb vinaigrette. Alternatively, meat lovers can indulge in Wood Oven Carnitas ($17.95) slow braised marinated pork, with achiote onion, fresh salsas black beans, rice and corn tortillas. For those of us on the breakfast streak, Chorizo Scramble Souffle ($14.50) was a light and fluffy egg dish with fresh chorizo sauteed with Yukon Gold potatoes, green chiles, Mexican cheeses baked in the wood fired brick oven and ends up on the table resembling the texture of souffle. 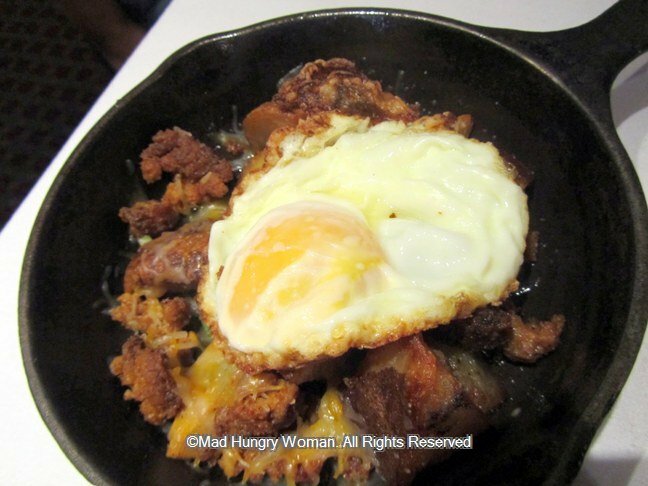 You can eat it with tortillas or on its own low carb style! All the portions are pretty big and I suggest sharing everything to maximize the things you can taste. This is a great place to spend with family or friends but make sure you call ahead and reserve a table because they get busy! 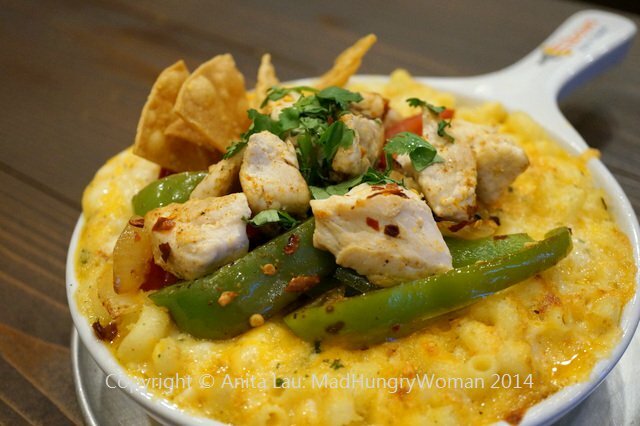 For an opportunity to try Cha Cha’s Latin Kitchen, enter in this week’s giveaway for one of THREE $20 giftcards to visit them. Just leave me a comment with your FULL name for one chance to win, or, for an additional chance, “like” Cha Cha’s Latin Kitchen’s Facebook page and diary of a Mad Hungry Woman’s Facebook fanpage and leave me another comment letting me know you’ve done that. GOOD LUCK! As usual, entries close on Sunday and winners are announced on Monday. Ahhhh what can I say about Bruxie that hasn’t been said already? The original Orange location is an institution and now, with its second bigger flashier location in Brea, you know they’re here to stay! The waffle-like exterior is impressive, standing out among the chain stores and chain restaurants in the area. The garage-feel is edgy and there is a lot more seating here both inside and outside. The staff has always been amazing and they continue to shine here. One of the original favorites is Buttermilk Fried Chicken & Waffle ($6.95) with chili honey and cider slaw. 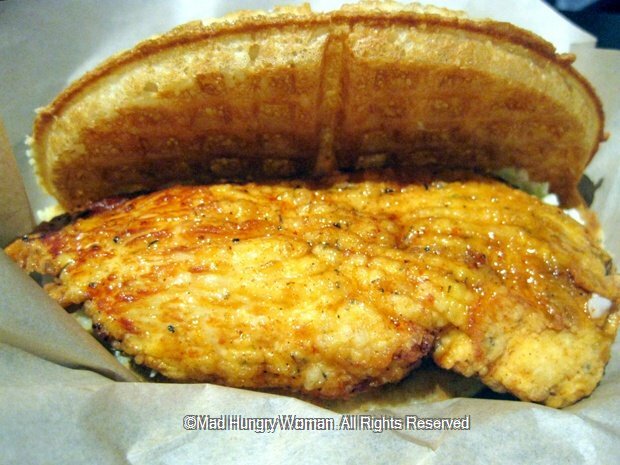 This is a bit too sweet for me, but as far as chicken and waffles go, you know they’re a marriage made in heaven. I loved the Turkey Club ($7.95) with Boar’s Head roasted turkey, gruyere, avocado, applewood smoked bacon and pesto aioli. This hefty sandwich will satiate even the hungriest bear. The stuffing is generous — a little too generous even … did I say that? — and puts many a club sammie to shame! Albacore Tuna Melt ($7.95) actually surprised me. 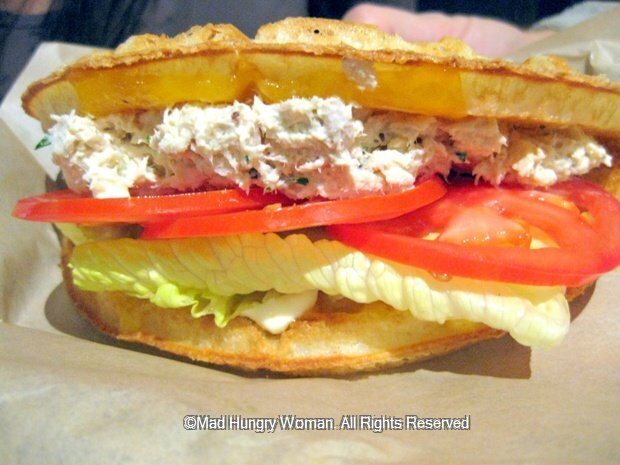 I wasn’t ready for a tuna sandwich to taste THIS good. 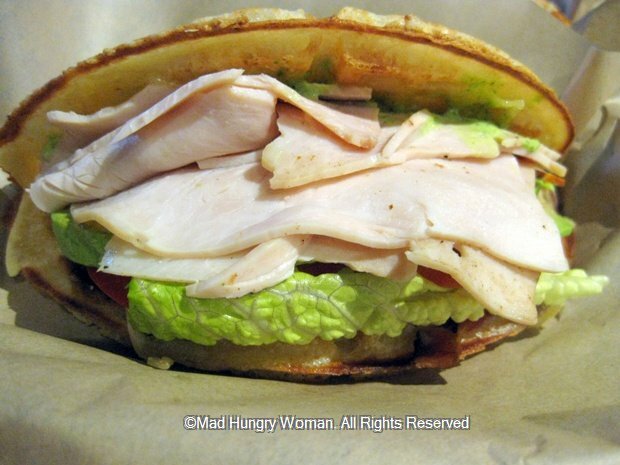 Cheddar cheese, lettuce and tomato in between a crispy waffle is just what mom ordered! It’s such a shame my son doesn’t like tuna. The secret to my perfect tuna sandwich are tomatoes! If I died and went to heaven, the Hot Pastrami Bruxie ($7.95) is what I was probably sinking my teeth into a few minutes beforehand. 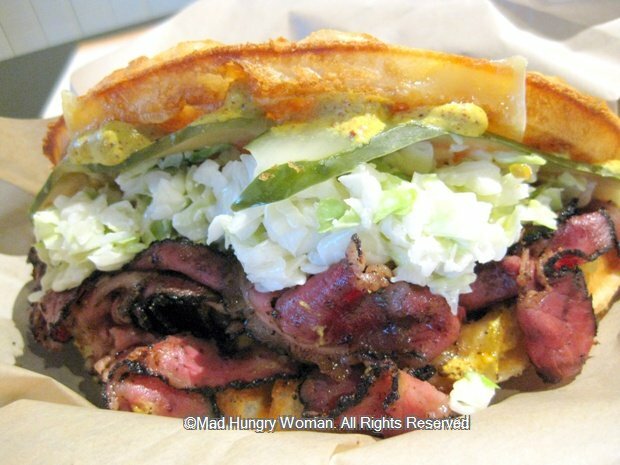 Boar’s Head Pastrami with gruyere, cider slaw, spicy brown mustard, and half sour pickles stuffed into the perfectly browned waffle is indescribably delicious. I believe this has now become my absolute favorite! 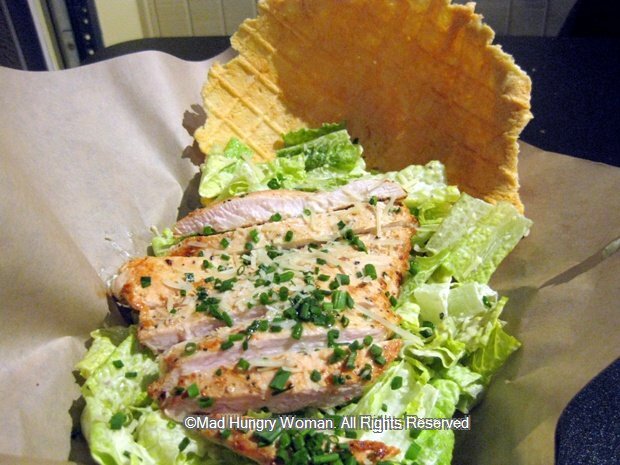 And should you be dining with some friends and you’re the one on a diet — too bad for you — then get yourself the Grilled Chicken Caesar ($7.95) served with the most delicious parmesan waffle bowl. I wish they sold this cheesy waffle bowl on its own because I’d buy a dozen and take them home to enjoy slowly! Bruxie Salad ($9.95) is another good choice. 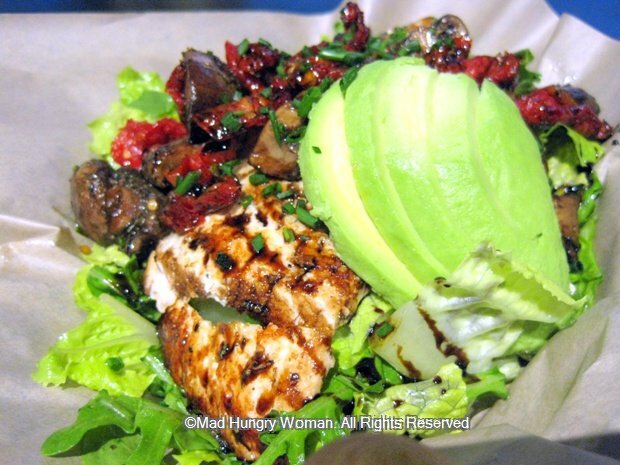 In fact, the grilled chicken is very moist and the romaine, arugula, mushrooms, sun dried tomatoes, avocado, lemon vinaigrette and balsamic reduction toss together makes for one of the tastiest salads I’ve had in a long time. Of course, we can’t walk away without trying at least one of the sweet waffle offerings. Lemon Cream and Berries ($6.50) is so lemony tart and pops with flavors from the seasonal berries — raspberries to be exact — that I wanted to stop but had a little more than I should have. 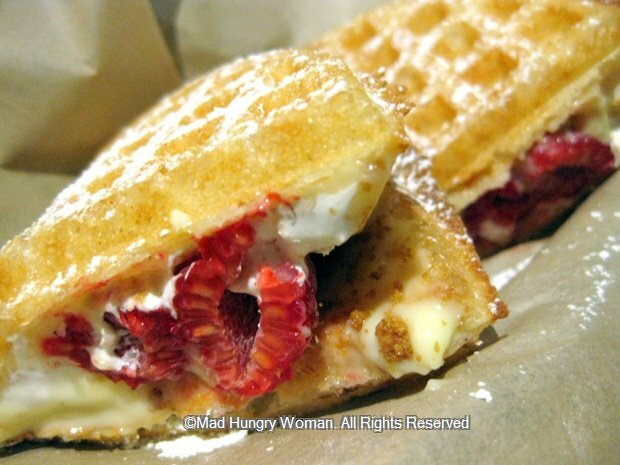 Who knew that a humble waffle could be transformed into so many delicious variations? 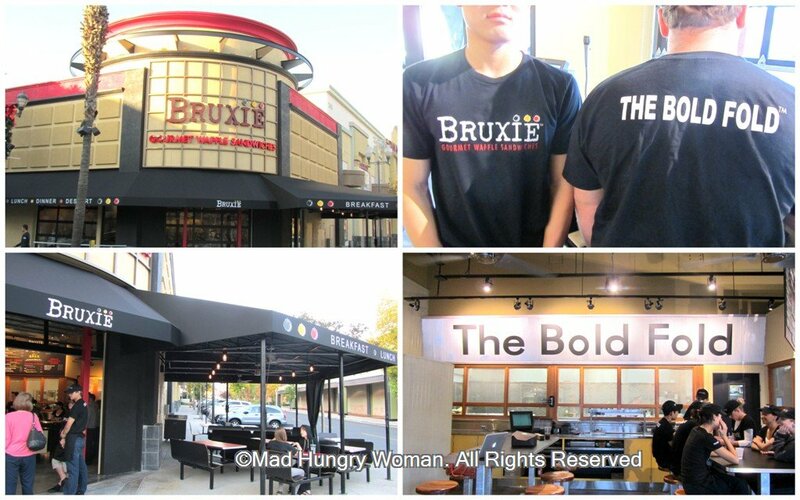 If you’ve never been to Bruxie in Orange, now’s the time to check out Bruxie Brea. Now I hope they will consider opening a Bruxie Irvine!